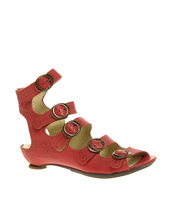 If you are on the hunt for a cute pair of flat sandals, you will not have to look far. So many pretty styles abound that it can be quite difficult to choose, so why get only one new pair? How can you resist flat sandals with rhinestone detailing that sparkles like diamonds? What about a strappy pair in a bright color or some leather ones with seed beads that express your boho flair? Flat sandals go with everything you want to wear, from maxi dresses and short shorts to the skinniest of skinny jeans. Your summer staple will not let you down.